Louis Schacht and his father, Henry, check their harvest. Vero Beach, Florida (CNN) -- Louis Schacht's family has been growing citrus in Vero Beach, Florida, for 60 years, contributing to a multibillion-dollar industry. But this year, he's worried. The winter weather blasting much of the country has made it to Florida, and the cold front now moving through is expected to last longer than usual. That could prove disastrous for Schacht and his fellow growers at the peak of the picking season. A chill can enhance the taste of the oranges and grapefruit that the Schacht family business grows and ships around the world. 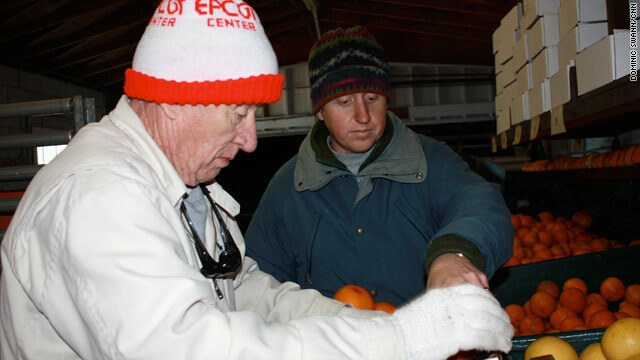 But if the temperature drops to 28 degrees Fahrenheit or below and stays there for four hours, fruit across Florida could be frozen and the crop destroyed. "If it stays just above freezing, it can really help sweeten the fruit, but it's a fine line to walk. If it gets too cold, you can definitely have some damage," Schacht said. He has flooded his 280-acre grove in a bid to protect his fruit, as have larger growers across the state. "What that does is create a little layer of warmth, usually about 20 to 25 feet from the surface, which is all we really need," Schacht said. And Schacht said that's just about all he can do. He said the fate of his fruit is now out of his hands. "We've basically done what we can do," he said. "You say a prayer and go to bed." CNNMoney.com: Will prices rise for orange juice? Schacht ships directly to customers around the world. "As a small grower, you try to sell everything that you can, direct to the consumer," he said. His crop contributes to Florida being the No. 1 producer of oranges in the country. "The citrus industry has a 9 billion-dollar annual economic impact," says Florida Citrus Mutual spokesman Andrew Meadows.